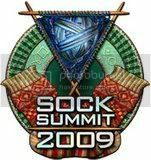 And Dianne managed to get our airfare to Sock Summit booked! We've been emailing back and forth like a couple of middle-school gals, we're so excited...Ah, adventure! Oh...and our flight out to Portland? Takes us into Salt Lake City! We'll be flying over you, Margene, and waving! It will be relatively late in the evening and we'll only be in the airport a short 30 minutes or so as we run to the connecting flight! But we'll WAVE!!!! Now all we need is to see what the availability and scheduling of classes and events will be - get ourselves registered - and then of course, the knitting of items to WEAR there!!! And deciding what to take to knit upon...! Ok, ok...I have a cat show to do first. Of course, they're Wendy's Cabletini Socks! I had to make a modification or two as my sis-in-law's foot is a bit more narrow - there are only 4 cable repeats across the top of the foot, and I'll knit my regular heel on them, since that fits my sis-in-law's foot well. I've got to get the oil changed - can you imagine that Jiffy Lube didn't have the proper oil filter for a Subaru Forester tonight? There was no one anywhere around, it was a glorious spring evening, the two guys were sitting outside, smoking...and sadly stated that the guy who does their ordering was falling down on the job, I was the second Subaru to come in on this late afternoon and they just didn't have the filters to do the job. Hmmm...something funny about that picture, huh? I'll be finishing Fiona cell cases, and packing and getting the oil changed on the car, meeting up with the friend who is keeping watch over the girls while we're gone. This will be a busy busy week! But I'll check in here and there. And the sock? Was frogged and restarted...I'll show you soon - promise! Saturday was beyond busy and I really could almost ask the question Stephanie asked yesterday as to where the time went? Well, I know this much: I woke this a.m. realizing that I was on the losing end of a months' long struggle to stay well...I've done so beautifully all fall and winter, not to have trouble with sinus or other infections, and have only dared believe that the vitamin D deficiency we discovered last fall and corrected over months of high-dose Rx supplementation was the reason I have stayed well so long...but, perhaps it was just good luck? I got the meds (which as we all know, bring on their OWN problems) and have dragged around all day hoping they'd kick in soon...maybe tomorrow? I'm am just beyond chilling out tonight, that's all there is to it! Dear Daughter came by this afternoon and made a few adjustments to the Nana Sadie Rose website with regard to notices. 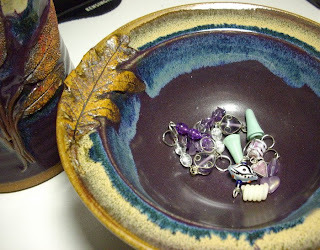 Once that was done, we began a bit of searching for materials for her stitch markers, as she'll be joining me in the booth at Sedalia Festival in May. While she surfed and edited, I cast on the toe of the Regia Silk sock for my dear Sis-in-Law. 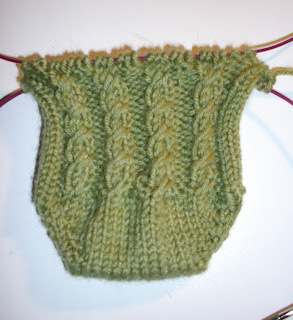 I think I'll look for a simple narrow cable to run up the side of the sock...just for a bit of interest. This is the sock yarn I won in Barbara Bretton's contest last summer - the color is so much better for my sis-in-law, I thought that would make a nice gift for her helping me next weekend in Charlotte! 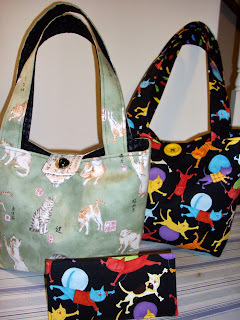 The fabric is long out of print on both bags...but I adore that Asian kitty print in sage. I have the same print in 3 other colors, but the sage is so long gone as to make me think I should auction this off on ebay! No, it will make the trip to Charlotte, with all the rest of them. While I sewed, I listened to a Suze Orman book downloaded to my MP3 player from Audible. I'm not sure I'll continue my "membership" with them, as I'm much more interested in free reading materials and my library has many opportunities there, but it's interesting...I must learn about Podcasts, and will take one of the one-hour mini classes at Sock Summit on just that topic! Oh here I go again, back on Sock Summit - I'll just never get to sleep, you know? But I should shove off to bed to help me get over this bug...and of course there'll be more sewing tomorrow. 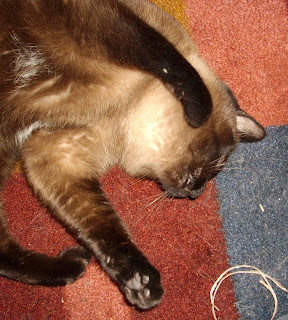 I'm a big fan of Siamese Rescue as you know...and a couple of weeks ago, I was browsing the website of available adoptees and discovered one I fell head over heels for. The foster mom was a woman I know locally, so I phoned her. Of course, he'd been spoken for, but she asked me, "Have you been approved?" For one thing, I have two cats, and that's all I can have here in this townhouse. 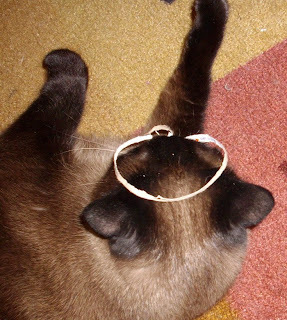 I had almost decided that when the Calico Curmudgeon had gone on to the Rainbow Bridge that The Meezer and I would wind up our days together. She is, after all, a Sealpoint Diva. 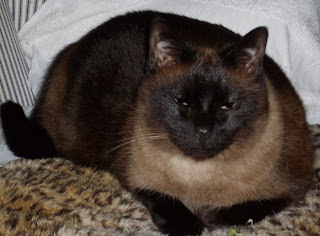 But...I saw this big seal boy, and faltered...and decided that just maybe having a big, happy, boy Siamese teddybear would be just the ticket to keep The Meezer from being impossible to live with. So, I applied. And I only told a couple of folks I email back and forth with, along with my coworkers, my vet, my landlord, a couple of friends...well you get the drift - everyone but you all! I didn't want to disappoint anyone (least of all me) if I didn't pass muster. 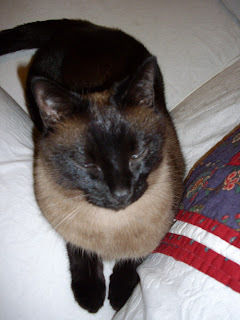 And - I'm approved to be a Siamese Cat Mom...! We'll be on hold for awhile, until the proper time...but that's approaching faster than most of us would like. 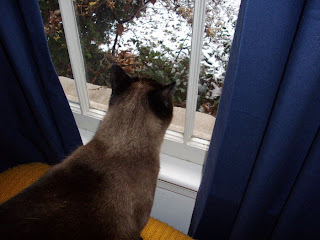 Still, to know that we can jump and get the "right" Siamese boy-kitty when he appears on the scene, is a relief. Oh! Mommie, A new TEARSTRIP? What do you mean I'm going to get a BROTHER? But he can't take my spot under the covers! Is There Such A Thing As "Finisitis?" Now, mind you, I only admitted to FOUR items for Rainy's Knit Along. And I'm stickin' to those four, for those purposes, but I wonder: might this be akin to spring cleaning? Weeding the garden before sewing my seeds? What say you? And do you think we could, like Norma, get this to spill over into a good general housecleaning? 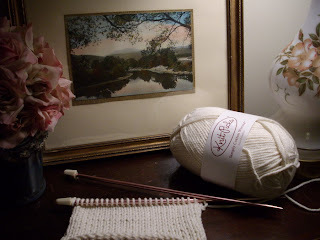 Pattern: Mine - the infamous "Plain Vanilla Stockinette with Picot Edging"
Time to Knit: Began March 1, 2009 and completed tonight. I didn't rush these, they're part of my Personal Sock Club on Ravelry's Stash Knitdown group, but I did want them finished before the end of the month so I could open the next grab bag and get those on the needles April 1 - before heading south for the cat show, where I'll NEED more socks to knit mindlessly in the booth! So once these they were done? I packed up Boing! which has been on the needles forever, to take to work for the next few days lunchtimes...Finishitis strikes again! OH...and thank you all for your lovely comments on my Diamond Fantasy Shawl. I love the way it looks, but wonder if it will end up being just a bit too delicate for the sturdy gal I am...? Diamond Fantasy shawl, this time knit in Shaffer Andrea in the colorway Renata Tiebaldi - such amazing tones in this silk - it's thread, not yarn. and she's managed to ignore me, right along with it! Thank you, Rainy! I finally got the necessary motivation to finish this one! It's not what I'd hoped. 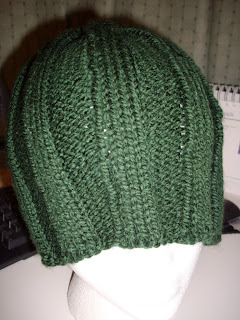 This was stash yarn, and is acrylic, so that's two points in it's favor, but I wish it were softer. I didn't use Caron Simply Soft as I usually do. Anyway, one item from the Basket of Shame, FINI! My Sunday night titles are getting more and more pathetic, you know? Sorry about that, but it's the way I'm feeling about the weekend...they go so darn fast, and at the end of them, I just feel as if someone used me to wipe up the floor. I will, I promise, be heading to bed a little early tonight. The ticker above is ticking away. 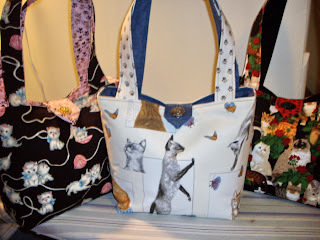 There's only 2 weeks, and one weekend before the Charlotte NC Crafty Cat Show. So you know what I've done this weekend, right? 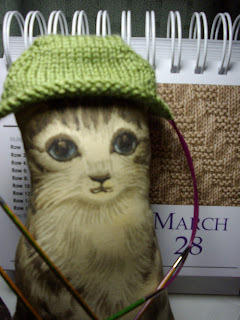 I could not put the Knitpicks Organic Cotton down. After I did a second swatch (and my eyes tell me that the first is closer to 19 stitches per 4 inches - on 7s - than the 6s are! 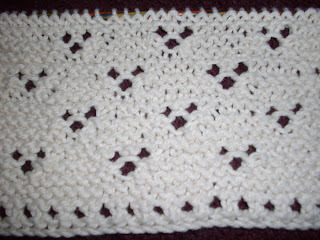 ), and then cast on for another dishcloth from Evelyn Clark's Dishcloths from the Heart. This one is Tiny Hearts. The one thing I'll say for my garter stitch on cotton? It's apparently all over the place. Maybe after I block it? HAHAHAHA! I'm going to block a dishcloth? Actually this is going to be a facecloth, as the yarn is so scrumptiously soft, I can't imagine doing dishes with it! And three Knitnanas. Take a close look at the first one, won't you? (Click to embiggen) Remember when I said there was another fabulous new black cat fabric I had to show you? This is the one. Purple, fushia and black (there's a touch of teal green in the cat eyes, and a bit of lavender in there, too). The fabric is amazing, and I'll be having a terrible time giving up this bag. But I will, because I'm going to make myself a Grand Mera from this fabric! Hopefully they'll be hits at the show. Off to catch a few minutes of 60 Minutes. Let's hope this week goes smoothly? TGIF! And What Do You Know? This was, I believe, the very best part of it: Cheryl Oberle's Knitted Jackets! 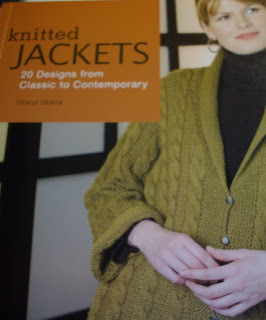 There is simply no question, just like Folk Shawls, this book will become a staple of my knitting bookshelf. The patterns are classic, there are only a couple of the twenty that I probably would not knit as they just aren't me, but the rest? I'll be knitting a long time from this book - they're gorgeous...I think Three Sisters (Ravelry link) will be my first choice. Just perfect, and simple enough that I can handle it. Last night, she was pestering me for treats (it's either that or food) and she fell asleep in the midst of it. Just like a little old lady! 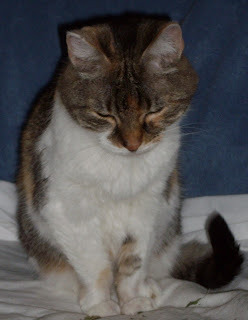 She woke up after the flash went off and decided the bit of catnip I'd left on the chair was just the ticket. 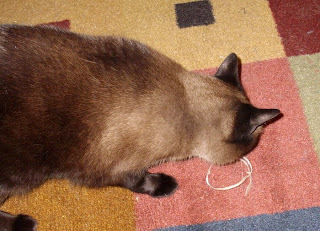 Poor dear, it's rotten to get old (she's 18 next month), but at least with me, she's still a sweetie - but not with The Meezer...with her? It's all World War III, all the time. I know, I know. I need to block it. So what do I think of the yarn? I absolutely LOVE it. I had wondered if I'd think it felt like Sugar 'n Cream - that's what I was afraid of, a dishcloth sweater - and I knew I'd HATE that. But it's nothing like SnC. Nothing - IT's just wonderful! Soft, drapey, scrunchy - just right for a cotton sweater. I've got like three different patterns I'm thinking I could use this yarn for...and there are several "natural shades" available. While it's not my best color, I'm thinking they need to add a "green" green shade, sort of sage-y, you know? 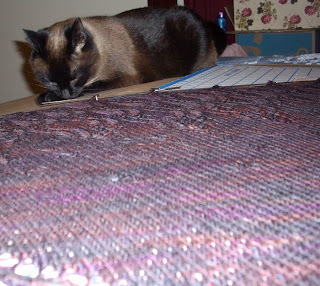 There are a couple of others down below in my 2009 OTN list, but both the Blue/Taupe/White ripple afghan and the Log Cabin blanket are long-term, cold weather projects, and I don't consider them something I've abandoned. 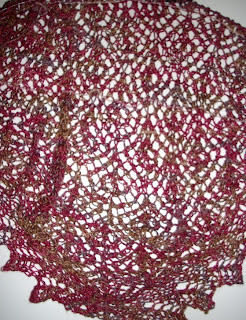 The Magickal Earth Shawl is one that truly isn't OTN right now - I've knit the swatch, and that's OTN, but I made a critical error in the chart-reading. 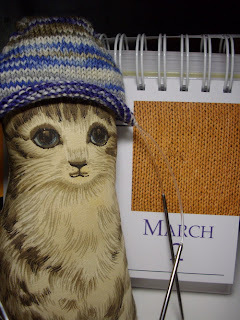 The swatch is going to come off the needles, and the project restarted when I'm ready, which isn't anytime soon, I don't think. And that ripple baby blanket? Well, he's not a baby anymore. It's time to frog it. 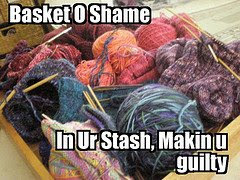 So, Rainy, I have 4 projects in my Basket o' Shame. That shouldn't set you back too far on the stitch markers! Thanks for starting this KAL! 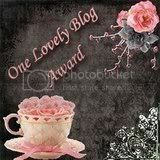 I haven't forgotten the blog, I promise! 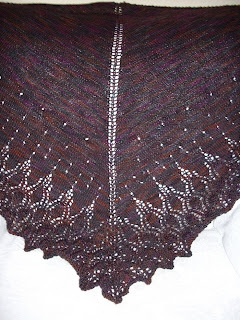 I don't have a photo yet of the Valkyrie Seraphim shawl that I'm happy with, so we'll have to wait on that. Our weather hasn't been the best, so outdoor shots were out, today was beautiful, but I neither had it with me, nor did I feel up to being photoed. I did a number on my lower back last night taking out the trash. I'm paying for it today, and probably will be awhile longer. I finished the first sock last night (plain vanilla stockinette with picot edge) and cast on the toe of the second sock. Click On By IF You Don't Want to See Boring Photos of Lace Blocking! She's Done! She's Blocking!!! And I'm in love...doing happy dances all over the place, and a little bit sad, too, because Mim's Seraphim is such an enjoyable knit! I will miss this project. I am very very glad that I have Knitpicks blocking wires, and today I went and ordered their new puzzle piece blocking mats (and probably should have gotten 2 sets, because this shawl? I'll just settle down here and stand guard over it while it dries, just in case, okay? While I was out (shopping for fabrics, of course) I stopped at our LYS and they had this lovely bamboo sock yarn (I was conservative - I only bought two colorways!) for summer socks and then the two Addi 16-inch circulars in size 2.5mm (size 1.5). Ok. I was bad. I'll blame it on the sadness of ending the Seraphim knit. 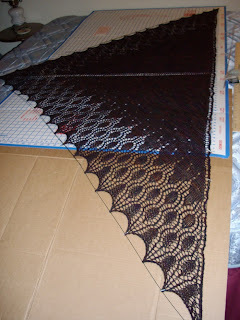 Don't you have a postpartum depression when a big lace project ends? No? The Meezer is out of sorts tonight. But, it really has been too long, and I try hard to stay in compliance with local laws. So the appointment was made and last night the carrier came out of the closet, was set upon the office floor and the lid opened. 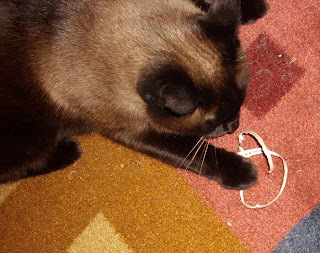 My plan was simple: I left the office a few minutes early this afternoon, ran back home...came in the door, hung up my coat, climbed the stairs to the office, sat down in the chair, turned on the computer (pretending it was a normal coming home)...and within 60 seconds, The Meezer was at my side, asking for strokes. I turned slightly away from the computer, reached down to stroke her head....turned the chair a bit more and she moved slightly to allow it...stroked her a bit more...turned the chair a bit...stroked...down around - and in one swift motion (chair at right angles to the carrier) I scooped her up and plopped her inside, closing the lid and clicking the hinges shut. 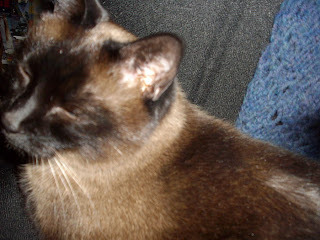 The Meezer rarely sounds like a typical Siamese. She doesn't cry like a baby. 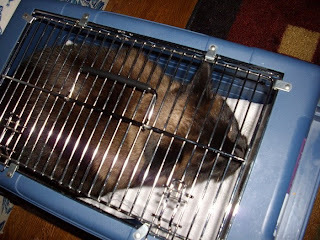 Until she's in the carrier. THEN you would think I was trying to kill her. Not the least bit stoned, is she? It's Thursday. Whew. It's been a busy busy week! Work has been challenging (which beats having to prop up my eyelids with toothpicks, as I have done in my lifetime, so I'm NOT complaining...I remember one temp job lo' those many years ago...where I literally entered 3 3-line journal entries into the computer once a month - snore! Yes, that was all there was to that job...and people wonder why I went through a spell of migraines there? I am SO glad I do not have that job any more - didn't have it after 3 months, in fact because I was about to go stark raving mad!). The one on the right you've seen before but the other two are brand new. Cute, huh? And - Ta Da! - Valkyrie Seraphim came off the needles tonight! All ends are woven in. 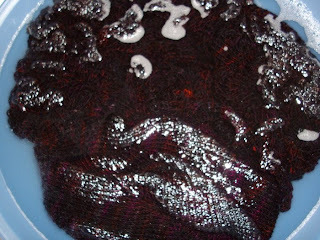 I won't block her before Saturday - I absolutely must soak her well, and rinse her in white vinegar water, as my hands turned black from the dye every night when I knit on her. But she is gorgeous. The pattern is delightful...I can't believe she's done! With a little luck there'll be a photo shoot over the weekend! Whoo hoo!!! 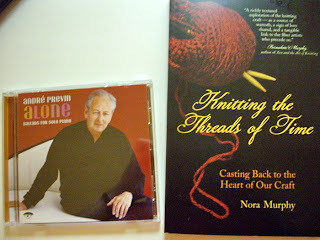 Tonight, on Jocelyn's recommendation I picked up Knitting The Threads of Time. I'm almost finished reading an excellent memoir by Alix Kates Shulman To Love What Is, the story of her husband's serious fall from their loft bedroom and the brain injury he (and she!) have recovered from. A difficult book, but an honest and amazing story of love between two people who'd loved each other as teens and came back to find each other again after separate lives and marriages. Sometimes the second times around are better, and sometimes life sets us reeling anyway, as if too much happiness isn't allowed. Well this book details the manner in which Shulman and her husband muddle through to come out the other side, damaged, changed, but still happy. A stunningly beautiful book, in my mind. If you know of someone with brain injury, this might be the book to help you understand a bit more. And it's certainly the book for the primary caregiver to read. Still, I wanted very much to read my friend's recommended knitting book, and it wasn't available at the library here (or at B&N), so had to order it. At the same time, I'd heard, on our local Public Radio evening jazz show a bit of Andre Previn at the piano. It so reminded me of my brother's piano jazz...and this month is 6 years since his death. I found the CD online and asked them to get that in for me, as well, and went to pick both up today. These will be my weekend pleasures! Don't mind me, I'm just trying to kickstart the economy all on my own....So the weekend will be: Good music to listen to along with working on the vet's books again, and sewing a few more bags. And a good book to get me to the sleepy stage at night! Then, too, this weekend will be for deciding on the next project. Will it be a shawl? Which one? Part of me is thinking the Sampler Shawl from Folk Shawls in the wonderfully soft undyed cotton from Green Mountain Spinnery...Wouldn't that make a nice summery wrap? You know how you think, after you've done something enough times, that you "KNOW" what you're doing, so you proceed merrily along, oblivious? This is now the fourth (yes, FOURTH) attempt at knitting the heel of this sock from my Personal Sock Club, the March 09 edition. 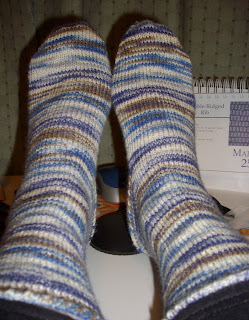 Last week, during a training, I knit the heel bed and picked up the gussets. 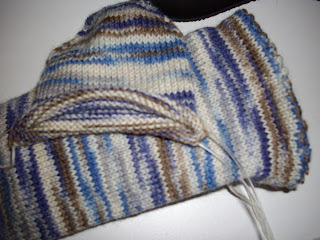 And realized too late that I'd managed to forget to turn the heel. Pull out the needles, and - RIP. 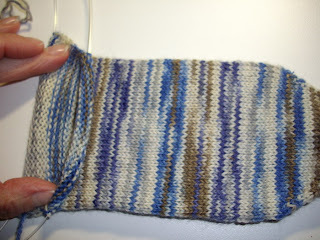 Stick the needles back in and proceed to turn the heel. These are the new Hiya Hiya stainless steel needles which don't come in my preferred size of 1.5. These are 1.25s. So I added two stitches per needle to make the sock fit my foot. Um. Have to account for that when you count off to turn the heel. I didn't. I used my standard formula. The heel was cockeyed. Over the weekend, I knitted merrily away again, picking up the sides and beginning to knit the gussets, but you know I was also sewing, and also working on Valkyrie Seraphim. So I didn't get all that far. Today, I picked back up on the gussets, knitting away, and suddenly thought - I haven't tried this sock on, I guess I should see how deeply I need to take in the gussets - and of course, you realize that on trying the sock on it was TOO SHORT for my foot! Yes, I frogged again. And right after I started to knit the heel bed, about 10 rows in, something whispered in my ear..."try on the sock." I hadn't knit the foot far enough down to my ankle. So once again I RIP, then I knit a few more rows on the foot, and tried it on again, and this time, I am in the right place and have started the heel bed again! Hm. Thought I was good at knitting socks. Learned my lesson. Socks are whipping my "you know what" right now. 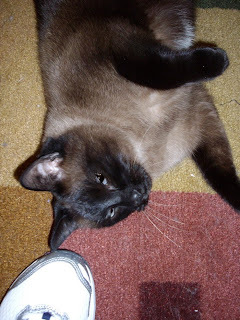 After I took the sock photo for this blog post I thought, hmm...haven't shown you all a pic of The Meezer lately, and looked around but couldn't see her anywhere. I actually said out loud, "Well, I guess I'll post without her, I wonder where she is?" And I think I've lost my ever lovin' mind. Wednesday has just got to be better! 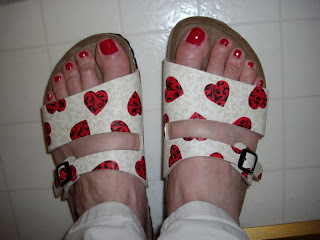 It was in the 80s again today, and I pulled out the nail polish and did my toes last night, planning on donning these sassy little Birki's with black and red hearts on a toast and ivory swirled background - they work nicely with khakis and a black top! Temps will be steadily decreasing all week till we're back in the 40s over the weekend, so this was a treat. And I'm not really ready to break in these sandals (I have 3 new pairs, all bought on drastic sale!). But I have to be careful with this plantars fasciitis, and go slowly with them. I bought a new pair of jogging shoes (jogging? I can barely walk thru the grocery store! ), in the hopes of being able to start getting a little more exercise - I went to one of the "good" stores where they actually know how to fit your feet and try a lot of shoes, and advise you on different things. I'm hopeful that these will work, but after only 2 hours tonight, I had to take them off. Breaking them in takes time. And I'm only wearing them indoors till I know for sure they'll be right. By the way? I put up a few new sets of stitch markers from my daughter in my etsy shop! 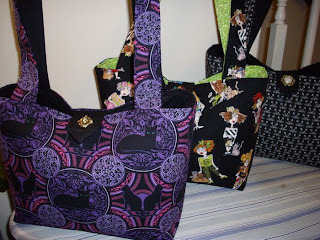 Since the Crafty Cat is only 3 weekends away, I was busy finishing orders and getting bags made for that show. Too late, I learned that the Richmond VA Southern Region Persian Society Show will be a two-day event this year, and is the weekend of April 18th. I can't see how we can do it. And I'm really sorry about that, as we enjoyed doing that show two years ago, when it was just a one-day event. Still, Charlotte NC is new territory for Nana Sadie Rose, so we're hopeful it will be a fun weekend! If you're in the area on April 4-5, please do stop by!!! Yes, it's dogs. Retrievers, to be exact. Black, Chocolate, and Yellow labs. 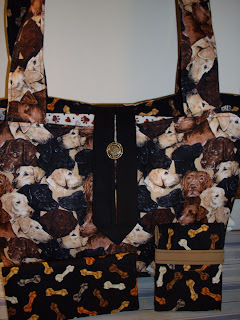 Do you have any idea how rare it is to find a single dog breed on a fabric? It's far harder than people presume, and when I find those fabrics, I usually get them. 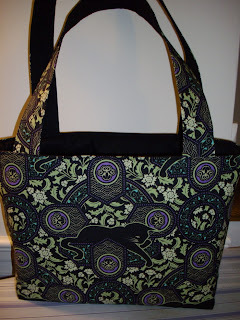 This is a Sadie - the largest, and most detailed bag I make. Sized for a laptop, water bottles, electrical cords, your wallet, and even your knitting and lunch (depending on how big a lunch you pack, of course!). 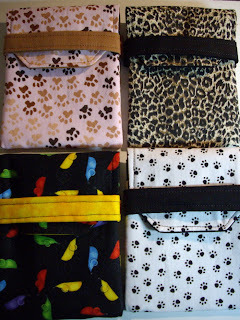 The customer wanted coordinating checkbook cover and Fiona cellphone case, too, so the bone fabric worked nicely there. 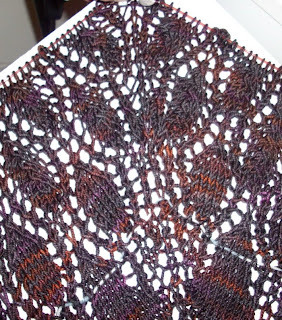 I managed to get some knitting done, but am still shy of the finish line for Valkyrie Seraphim...That's okay, though. 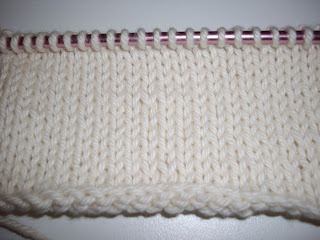 I can't block until Saturday now, so if it takes all week to knit four more rows, and then cast off and weave in ends? That's fine! 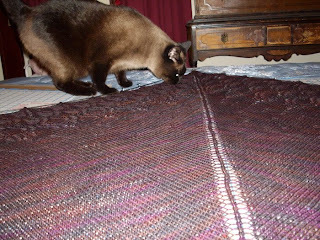 Otherwise, I'll just be looking longingly at the finished product, wishing I could take time off work to block the shawl. 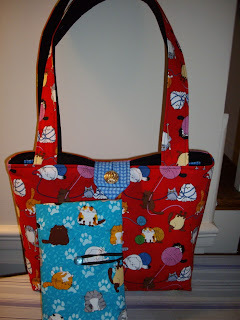 I have several bags cut and ready to sew this week when I get home. But for tonight? I'm going to try to get in bed a few minutes early to counteract this loss of an hour's sleep last night. Remember all the snow on Monday and Tuesday? Remember???? 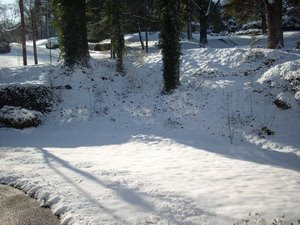 Yesterday when I left for work it was still piled up all over the place, a winter wonderland that we almost didn't get this year. But when I got home? Look what greated me! I am not kidding. It was 75 degrees yesterday afternoon and it's going to maybe hit 80 over the next three days!! 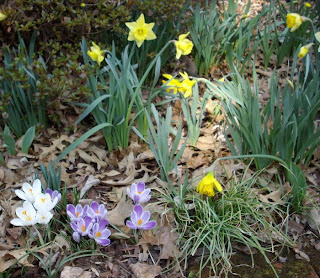 Spring has sprung - and there's no question where the "flowers is..."
So back inside we went. 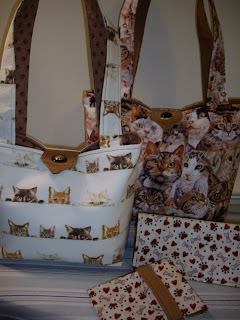 And I've spent most of the day busily cutting two of my largest bag styles - the Sadie and the Grand Mera. 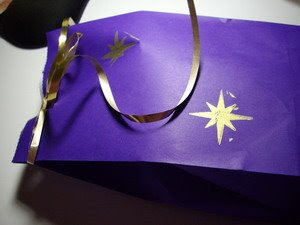 I hope to have photos to show you tomorrow night, but these bags are the most time-consuming and challenging to make! 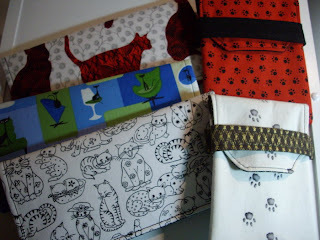 Still it's time for cat show bags, so come back and visit off and on over the next couple of weeks - you'll see some new and great fabrics (as well as a few old friends, too). Yes, there's a light blue lifeline in there, simply because I'm paranoid, but this is a really easy lace pattern and it's easy to see when you get off track (which I'm known to do when I'm glued to my news programs in the evening). Still, I believe in being safe rather than sorry! edited to add: I think I just found a yo that's not supposed to be there, just by supersizing this photo! ARRGH! I hope you're having some lovely spring-ish weather this weekend - Don't forget that Daylight Savings Time begins tonight - Spring Forward! remember my wonderful Christmas gift to myself? The One Wintery Night sage leaf mug that matches this vase? 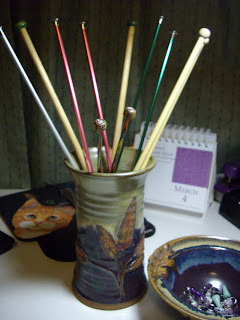 After I got that mug, I started thinking about how it works so nicely in the knitting room/office with the sage curtains and the purples and blues and burgundies...so I convo'd Karen at her etsy shop and place a custom order - for the vase to hold knitting needles. Once she had it completed, she convo'd me, and when I went to purchase it, I saw this bowl in her shop - the oak leaf reminded me of the towering oak at my mother's home, and I just had to have it. I figured it was perfect to corral stitch markers and point protectors and such. Oh my, when they got here? I almost swooned. They're even more beautiful in person, and of course, my photos just don't do them justice. I'm a pottery fanatic, but I think these are my favorite pieces of all my years collecting handcrafted pottery. Which is a really good thing. Because I really don't have anymore space for such things! Oh...btw...do you see that ticker up there? The first one: The one that says less than ONE month until The Crafty Cat? What's The Crafty Cat? It's the Charlotte NC cat show at the Mercandise Mart on April 4-5, 2009. I'll be there. We're taking Nana Sadie Rose on the road, again! However. You know when they say on the school delays "essential personnel report?" Um. When it's payroll? I'm essential. So I put in a half-day's work today, by myself in a mostly darkened office (except for mine). Except for when I was running to get signatures on the payroll and getting stuff to the bank, all part of the normal routine. But, you know, I don't mind. It's nice to be needed, and there's something to be said for job security these days, especially when you love what you do! And I do. 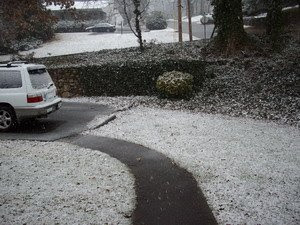 Our roads were perfectly clear (at least the main ones were, I don't know about the neighborhood streets). It was absolutely frigid, tho,' and is going down to 11 degrees tonight. And will be in the mid-60s by Friday. The good news? 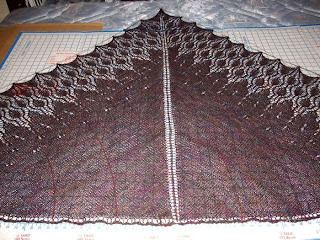 I spent many happy moments working on Valkyrie Seraphim this afternoon and evening...I'd show you but you know how it is with lace - it's just a blob till it's blocked! When I went to bed last night it wasn't doing anything, but they warned us we'd have more overnight. And they were right...I believe we have had as much as 5 inches - which is a lot for us. And since the schools were all closed that meant our office was, too! I finished an order for Nana Sadie Rose. Yes, you've seen these fabrics recently - there's no more of the turquoise Fat Cats fabric now, this Glady case was the last of it. I still have a bit of the red Knit Wits fabric (and some of the grass green colorway, too) in case you're interested. The Knitnana makes up nicely in that fabric, I think. Thanks for your help, Miss Muffin. A review of the Hiya Hiya stainless needles: I like them! They are nicely slick, the joins are smooth, but the cables are a bit stiffer than the Knitpicks Options. They are not so highly polished as my original set of KPs (which was the problem with the second set I ordered, they were so badly and unevenly tarnished that they seemed "sticky"). So far, I've had no problem with ocular migraines from the reflection (that is a huge thing in my book!). They're quite pointy, but I have not had to contend with split yarn, nor have I had a puncture wound (which I cannot say about Knitpicks Options). 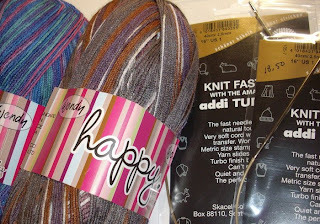 I believe I paid $5 more for the set than I would have for Knitpicks Options, and I did have to pay for the shipping ($2) but the needles got here in two days instead of two weeks. I've also finished the second chart of the Valkyrie Seraphim and am ready to start the third one. I also joined the third skein of STR Raven Valkyrie in the process! Whew! 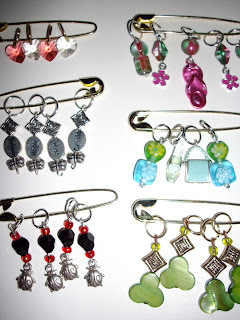 And a big thank you to those of you who've purchased stitch markers from my Etsy Shop - my daughter is delighted! A Second Post on Sunday? Not sure I quite believe this...and depending on whom you listen to? Perhaps as much as a couple of inches of this stuff? 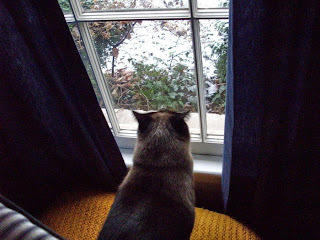 I don't like the white stuff, Mommie...make it go away? Snow? And What's This About Jewelry at Nana Sadie Rose's Etsy Shop? My daughter stopped by last night with a few sets of bejeweled stitch markers to put in my Etsy Shop so I wanted to share with you! 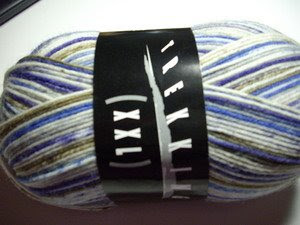 Trekking XXL in colorway 54. Blues, white, and a very drab olive. But wow, after last month's very dreary and dark yarns? This is like a breath of spring. And I need it. Yes, tonight I'll put it OTN - on the NEW Hiya Hiya stainless steel needles, to be precise. After all, I'm heading back to work tomorrow and will need socks to work on at lunch! Hope your week goes well!